Bubble Bubble slot is a new surrealistic looking machine developed by Real Time Gaming (RTG). The game is stacked with multiple bonus features, expanding wilds and multipliers. Together with other recent releases, like the Pirate Isle and Orc vs. Elf slots, it seems that RTG managed to break away from the regular simple looking slots and catch up with the rest of the gambling world. For many, Bubble Bubble reminds the funny computer game from the 90s. Well, the Bubble Bubble slot has nothing to do with the original game. It’s a Halloween themed slot, with Witches, Ghosts and other scary and surreal symbols. Winni the Witch is the wild symbols of the game. It appears on reel 3 as an expanding wild, covering the whole reel. When in a winning combination it triples your payouts. The Cauldron is the scatter symbol and the one that triggers the bonus features. The number of lines is fixed on 50 and the bet size varies from $0.50 and up to $250, which is good for the those of us looking for high limit slots and casinos. Bubble Bubble offers three different bonus games: Wild Witches, Great Ghosts and Bewitched. They are all triggered the same way by getting 3 scattered Cauldrons anywhere on the reels. As you will see below, the features allow you to control the volatility of the slot. The Great Ghosts gives you the highest number of free spins, but usually with lower payouts. Wild Witches can be the most rewarding bonus, but you have only 7 free spins to make it work. The Great Ghosts bonus will get you 20 free spins. During the game additional wild symbol will be added on the reels – the Ghost wild. Every time a scatter symbol appears on the reels, Ghosts wilds will fly in and land on various positions. There can be up to 9 of those. 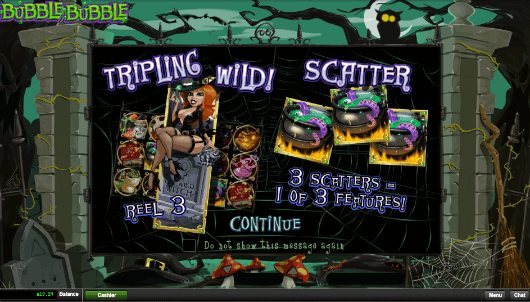 With Wild Witches you will get 9 free spins. The special part is that every time Winni the Witch appears on the reels, she will expand to 2 additional reels, making 3 reels completely wild. Wild Witches bonus also has a Win-Win feature, which insures a win of at least x10 times your bet. If you are “lucky” not to win anything during the free spins, you will be given x100 of your original bet. 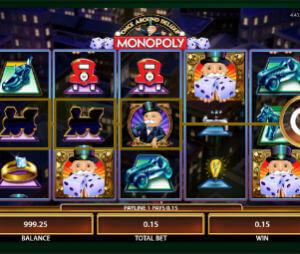 Bewitched will give you 7 free spins with sticky wild on reel 3 for as long as the feature is active. Personally, I find the design of this slot a bit chaotic, but still I enjoy playing this game and glad to see RTG develop new and different looking slots. Three different bonus features with expanding wilds are fun and can be really rewarding.